Today's post is the 100th on my blog, a landmark accomplishment worth being celebrated with a spectacular design that epitomizes the Celebration. To mark this accomplishment, I couldn't think of a better design than the original "Le Carnaval de Venice" ("The Carnival of Venice") by Hubert de Watrigant. 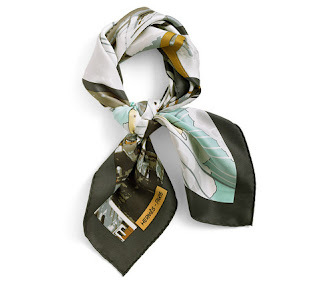 As your eye focuses on the pictorial placed in the center of the scarf - depicting an equally impactful and prominent St. Mark's bell tower overlooking Piazza San Marco (St. Mark's Square), you notice the passers-by, themselves dressed in period costumes, admiring the symbol of the "Serenissima" Venice. Perhaps more than anything, this is one of my all-time favourite designs, and what's a beautiful gift if I cannot share it with friends ? 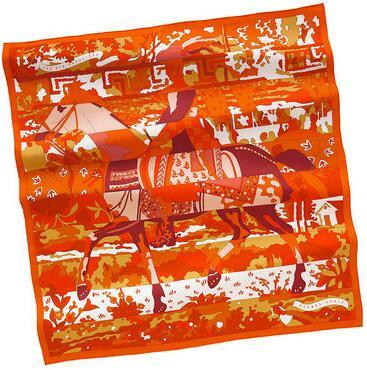 Happy 100 posts, and may you savour many more posts whose subjects - the beautiful Hermès scarves - will continue to fascinate, mesmerize, and ultimately inspire you. This design caught my attention not so much for the actual theme as for the freshness of the design despite its reminiscence to "Bolduc", a scarf issued in 1983 and reissued many times since, in different sizes and on different materials, to great success. "Très Kelly" ("Very Kelly") is a tribute to the iconic element of the Kelly bag, and of many other successful Hermes bags: the leather straps (they are paired, one from each side) that secures the bag shut. Kelly is, of course, the name attributed to one bag model that the late Princess Grace Kelly carried. She was pregnant at the time and when confronted by a group of paparazzi, decided to keep the pregnancy away from their peering eyes so she covered it with her bag. This is the legend that saw the bag's baptized "Kelly" and gave birth to a cult around the world. 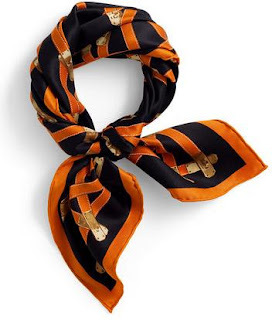 Unlike the "Bolduc" (which featured the object that gave its name to the scarf design - the thin ribbon used to tie gift boxes), "Très Kelly" features one element, absent from previous designs, that heightens the interest in this design: the metal clasp of the two leather straps - an element that breaks the monotony of the design by adding variety along the lines of the straps themselves visually, both by way of a different pattern (albeit discreet) and of a different colour (in that sense alone, the apparent randomness of the individual clasps reminds me of the flight of countless insects - be it ants or bees). 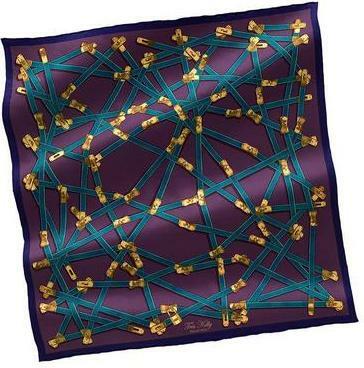 When knotted, the scarf illustrates the pattern in much the same way as the Bolduc scarf does, except the element of fetish here - the leather strap and the metallic clasp - confer this scarf a stronger, more confident personality, traits that the person who wears it (uniquely suited for both men and women) is likely to share. I am very excitedly welcoming the new Fall/Winter 2010 collection of Hermès scarves, just as the peony flowers have recently blossomed in Toronto. The focus of today's post is "Quand Soudain" ("when suddenly"), a set of four instantanés ("snapshots") from Paris, depicting the Montmartre hill (with its highly recognizable symbol, the Sacré Coeur cathedral, the House's iconic flagship store and head office at 24, rue du Faubourg St.-Honoré, a close-up of a horse's head, a depiction suggestive of the equally iconic horse atop the House's building, and finally a horse in apparent flight. What I find fascinating is the style of the story line, as told through images - reminiscent of the cartoons so beloved by children. I grew up with several -old- issues of the Pif Vaillant and Arthur (le fantome) magazines (back in the days, Romania was under Communist regime, so those issues must have belonged to other generations from another era), French comic strips (bandes dessinees) with lovely characters such as dog called Pif, and a fantome (Arthur) and their adventures both at home at on foreign lands, during their travels. The captions on this series of images, starting from the upper left hand corner and descending diagonally across, read - just like a comic strip text - "at the same time, in Paris, all was calme", followed by "when, suddenly" and "to be continued". 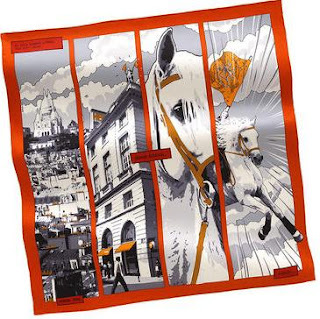 Although the approach of dividing up the overall scarf space into strips of different pictures is not new, this scarf is particularly charming because it contains so many references to Paris and to Hermès, which - themselves - trigger a certain fascination and instill in the admirers a desire to pack their bags and head to the Capital of Lights to enjoy its refinement. One reason I recognize such an effect of this particular design lies in its depiction of photo-like images, rather than partial pictures of previously released designs (of course, the air of nostalgia triggered by looking at those images, drawings replicating the real world, just like a children's comic strip, only adds to the scarf's beauty). 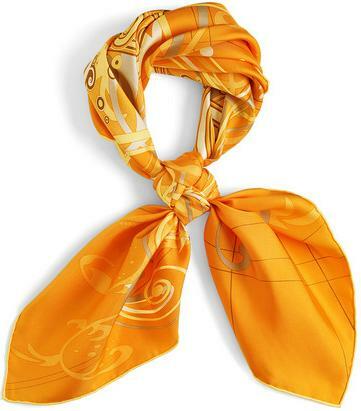 Disappointingly, the scarf does not pay necessary tribute to its design when knotted. 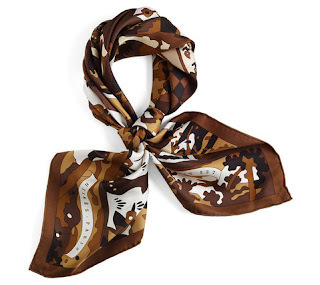 The majesty is the design is simply lost, appearing simply as unidentifiable colour "stains", perhaps appropriately and skillfully achieved as a "vintage" scarf. The concept behind this scarf has been the ubiquituous designs found on older, leather-bound story books, so rare yet so dear to children and parents alike. Glacing over such sophisticated lettering carries my thought to the excitement that every child experiences upon seeing the parent, grandparent or otherwise the special person holding a story book, ready to enchant the little ones with the searches, voyages, free spirit, bravery and gentleness of heroes of times past. My fascination with this design stems from the illusion of (time) traveling that this pattern induces - as my eyes glance over the entire scarf, from the lower half of the design (which is the focal point on the scarf) across its upper part, I perceive the design as one of those images associated with the sensation of gliding over territory from an airplane, or more appropriately a time capsule, at ever increasing speeds. The horizontal lines, reminiscent of the lines across a musical partition, send the viewer on a journey to the right of the book cover, expecting the reader to uncover the pages and dive into the fascinating worlds hidden beneath. 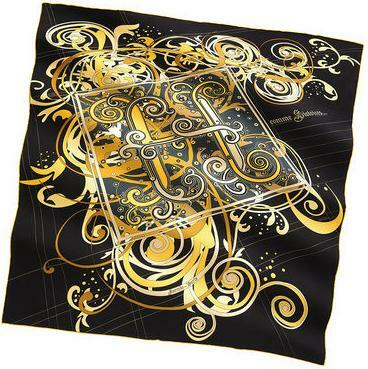 The scarf ties surprisingly gracefully, with its pattern showing only discreet elements of its design. Really wonderful ! Featuring a fantasy design, this scarf took its name from the Tanzanian artist George Lilanga whose claim to fame were the paintings realized in the same style, featuring local village folk attending to various activities in their daily lives, portrayed in humourously with large ears, elastic and contorsioned legs and otherwise simplified facial expressions. These stylized figures and abstract splashes of colour alternate, to instill a movement uniquely captured by this design. 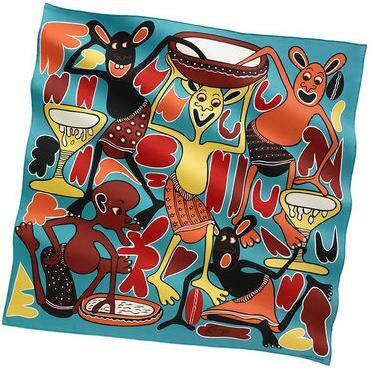 Lilanga is thought to have painted his characters to reflection the image that he retained from his own years in primary and secondary school, years marked by a vivid happiness. The story of this scarf is equally fascinating. 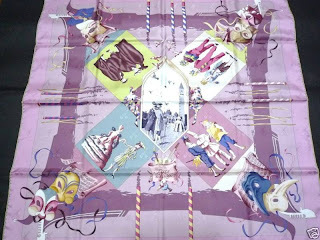 Hermes Art Director Pierre-Alexis Dumas felt inspired to transpose Lilanga's paintings on silk following the former's encounter with Jean Pigozzi, the famous contemporary African art collector whose collection includes artwork by Lilanga and who has taken an interest not only in the discovery and conservation of African art, but also in the making process. Of interest about this particular design is how balanced the entire scene appears, despite the busy patterns, given by both shapes and colours. 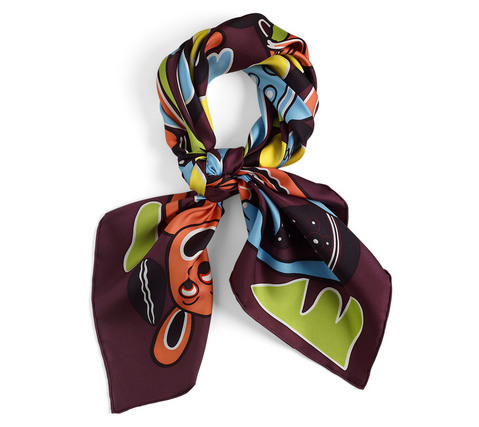 Ideal for those who could rely on a cartoon-like pattern to enhance their beauty and - more importantly - complement their personality. An old legend tells the story of this horseman, riding endlessly across the vast world, never dismounting. Feeding only on the infinite spectacle of the thousand and one countries crossed, he meets nine other solitary horsemen in succession, arriving from every corner of the universe. Then, as if by magic, the ten riders get together and join up to form one single horseman, the carrier of all the legends. Brimming with all their knowledge, this rider continues to traverse the world, until the end of time. To illustrate this encounter, the design of the carre Les Dix Cavaliers has been divided into ten bands, each dedicated to one of the horsemen. The pattern is reminiscent of the “Le monde est vaste” pattern of last year’s collection, in both concept and realization – with the original canvas “sliced up” and the stripes put back together in an apparent random fashion. Unlike the previous pattern, however, where the softer colours rendered the colour combinations harmonious, the horizontal stripes make this design appear fairly busy, thereby inducing a certain tension in the overall scarf. It definitely requires a strong personality to sport it, as the colours on their own – and the contrasting colour combinations are fairly strong.